The Dove Orchid belongs to the genus of the orchid species known as Peristeria which is a Greek word that means dove. This orchid is also frequently referred to as the Holy Spirit Orchid or the Holy Ghost Orchid. 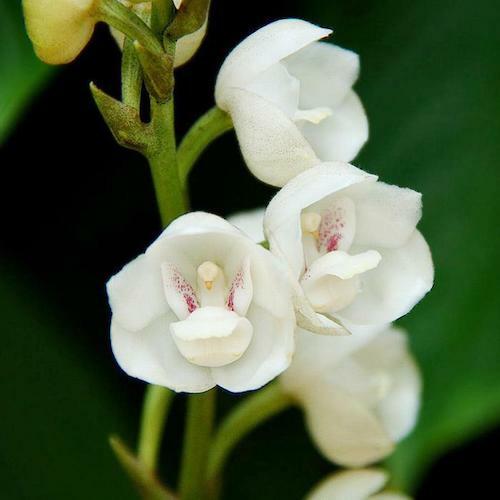 The Dove Orchid is the national flower of Panama. This orchid species has been designated as endangered in its natural habitat. This is due to the over collection of these amazing orchids. This “flower of the holy spirit” can be seen growing in large numbers around the edge of hardwood forests. These orchids are also seen growing in huge numbers during the fall which is the time when the trees of the hardwood forests have shed their leaves. This means these small plants get exposed to sunlight easily all through the dry and cold winter months. One interesting fact about this orchid species is that it can be both epiphytic as well as terrestrial. In its natural habitat this orchid, with flowers shaped like little doves, grows only in the months of August and September. This orchid species is referred to as the Dove Orchid or the Holy Spirit Orchid because of the tiny figure of a dove sitting at the centre of the flower. Some people also refer to the White Egret Orchid as a Dove Orchid but that is not correct. The smell coming out of these flowers is not sweet or sacred at all and, in fact, is said to resemble the smell of beer! Irrespective of this it can’t be denied that that these white dove orchids look very peaceful and elegant. Dove orchids are epiphytes, growing on the moss of the tree trunks in the cloud rainforests of Central America. The flowers of these orchids are so beautiful that they have become over picked and this has led to a situation where the species has become endangered and close to extinction. The plant is sympodial in nature (meaning that it does not grow from a single vertical stem but from a stem that is more or less horizontal) and it also has pseudobulbs (thickened stems at the base of each growth). Each pseudobulb can have up to 5 leaves. The plant is known for its inflorescence as it has many flowers growing on a thick stalk that can grow up to 135 cm in size. The Dove Orchid flowers are 2 inches wide and they are very long lasting. Growing this orchid is not that difficult as it can grow in warm weather conditions. It does require sufficient light all year round to produce blooms. The plant usually requires only moderate watering. To encourage growth when a new pseudobulb is growing heavy watering may be needed for a period of time. When the plant slows down its rate of growth, you should reduce both the watering and the addition of fertilizers as this may ruin the health of the plant. Lower night termperatures should encourage flower blooming to start. Dove Orchids require open and well drained pots containing a growing medium of sphagnum moss, cocoa chips, and tree fern. Remember to give the plant lots of water, bright sunlight, and warm temperatures if you want it to bloom in a healthy manner.